1. Creed works better as an actual movie than it does as a Rocky movie, which is quite the compliment, considering that it’s an excellent Rocky movie, too. (I hadn’t seen it yet when Grierson and I did our Rocky movie rankings on Monday; I’m higher on it than he is.) More than a mere boxing film, it’s a powerful, confident coming-of-age story about a man overcoming a difficult upbringing—and a world that’s seemingly out to get him—to figure out who he is, what he stands for, and what he wants to become. It’s just that, in addition to that, it is also a Rocky Balboa movie, or at least it’s folded into that franchise while doing what it can to launch one of its own. Which somehow never gets awkward—it’s impressive how seamlessly the traditional Rocky underdog story meshes with this rawer, more urgent one—but nonetheless, there’s an albatross dragging this story down. It’s good to see how ol’ Rock’s doing, and it’s pleasant to be back in this world again, but I want to spend more time with the kid. 2. 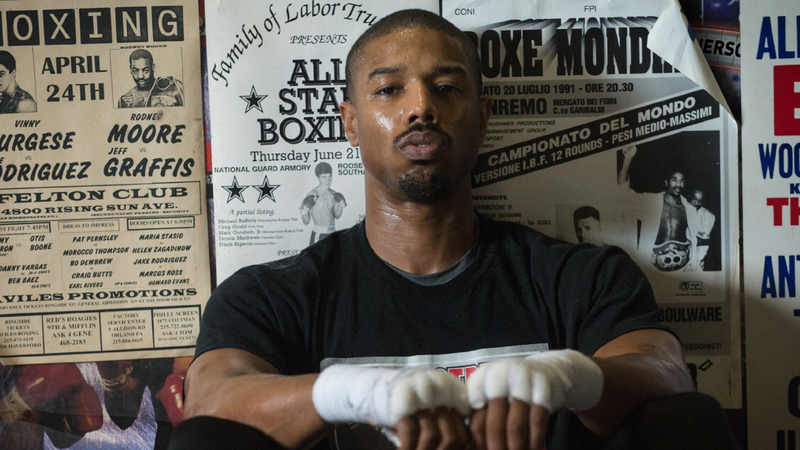 The kid is Adonis Johnson, played with vulnerable ferocity by Michael B. Jordan, who learns, after spending years in juvenile prisons, that he is an “illegitimate” son of the late Apollo Creed. His widow (Phylicia Rashad, whose every appearance brought Bill Cosby to mind, which is my bailiwick to overcome, not hers) tells him who his father is and adopts him, giving him a comfortable Beverly Hills lifestyle and a quality education. But deep down, the kid is a fighter, sneaking off to fight borderline-illegal fights in Mexico and quitting his job as a stockbroker to build his own name as a boxer. He moves to Philadelphia, forever tracing the roots of the father he never knew, where he meets a musician named Bianca (Tessa Thompson) who is losing her hearing; also, he tracks down the former heavyweight champ palooka with the lopsided hat who was his father’s best friend. (Or, at least those two shared some hugs on the beach.) Adonis tries to keep his name a secret, but in the internet age, that doesn’t last long, and he’s forced to decide whether to accept his father’s name and history, or build his own legacy. 3. The movie runs on two parallel tracks until they finally meet at the end. The first is the story of Adonis, his good-hearted nature wrestling with his anger and confusion about his life and his identity, and how Bianca not only helps him with his boxing and his sense of self, but how he does the same for her. It’s a lovely little setup, a boxer tearing himself down in the ring with a woman who, because she is going deaf, only has a limited amount of time left to produce her life’s work, and Jordan and Thompson are the perfect blend of power and grace, two individuals who weren’t searching but nevertheless find each other. Bianca (perhaps inevitably) ends up ringside cheering on her man, but the movie remembers to return the favor: He is more entranced by her work than she is his. 4. The other track is the Rocky story, as Rocky teaches Adonis how to discover himself as a boxer, and Adonis brings Rocky back from the brink after essentially retiring from his life after the deaths of Adrian and Paulie. This is the more familiar story, with the training montages, the motivational speeches, the in-ring theatrics, the rags-to-riches tale of a kid who’s gotta lotta heart. What’s perhaps most impressive about Creed is how well these hang together. This has a lot to do with director Ryan Coogler, who previously made the deeply sad Fruitvale Station, but shows even more confidence and assurance here. He shows a mastery of the fight scenes—including one bout that is entirely shot in one take, which is show-offy, but still pretty awesome—but even more comfort in the quiet scenes between Adonis and Bianca. I suspect he and Jordan, the star of Fruitvale as well, are going to do some amazing work together as the years go along: They have that same ability to be open and honest without ever feeling pandering or cheap. Coogler is a serious talent. 5. Meanwhile, it’s impressive that Stallone—once more embodying the signature creation of his career, and one of the most iconic movie characters of the last 40 years—would cede control of Rocky Balboa to Coogler, to allow him to be a supporting character in another, quite different story, is so surprising that it sort of breaks your heart. This is Rocky in the Mickey mode, the wizened old trainer trying to teach the kid whatever tricks he can before he’s gone. Stallone always gives quieter, subtler performances as Rocky than he does in his other films—he’s less cocksure, more sensitive and aware, as if he wants to honor the character who gave him the life he has—and he’s especially good here, particularly late in the film, when Rocky faces a major crossroads and must come to terms with the fact that most of his life is behind him, rather than in front of him. He concedes that the future belongs to Adonis ... and that Rocky owes it to him to protect that future. (Stallone has never looked nearly this comfortable with looking nearly this old.) This leads to the best speech of Stallone’s career, a stirring locker-room soliloquy about loss and pain and acceptance, all the more moving because it doesn’t really have anything to do with boxing at all. But as powerful as it is, I’m not entirely certain it fits in this movie. It’s a perfect coda to the Rocky character. But this movie isn’t about the Rocky character. 6. The movie ties it all together at the end the only way it could, with a big fight, and a big comeback, and a big speech. It’s a credit to Coogler and Jordan that it never feels as telegraphed and jerry-rigged as that, and if you’re squinting, you could almost convince yourself it was organic. One of the nicest things you can say about a genre movie is that it never feels formulaic while totally being formulaic, and Creed pulls that off magnificently: The movie nods to the original Rocky movies while feeling like its own beast all together. I think that beast is so strong, and what Coogler and Jordan have done so impressive, that I found myself wanting it to break free of its Rocky Movie constraints entirely and become its own animal altogether, to let Adonis and Bianca stand on their own. I love Rocky as a character, and I love Stallone’s performance here, but I wanted less of both of them. This movie is about Adonis and Bianca. They should have their own story. I suppose that’s what sequels are for.